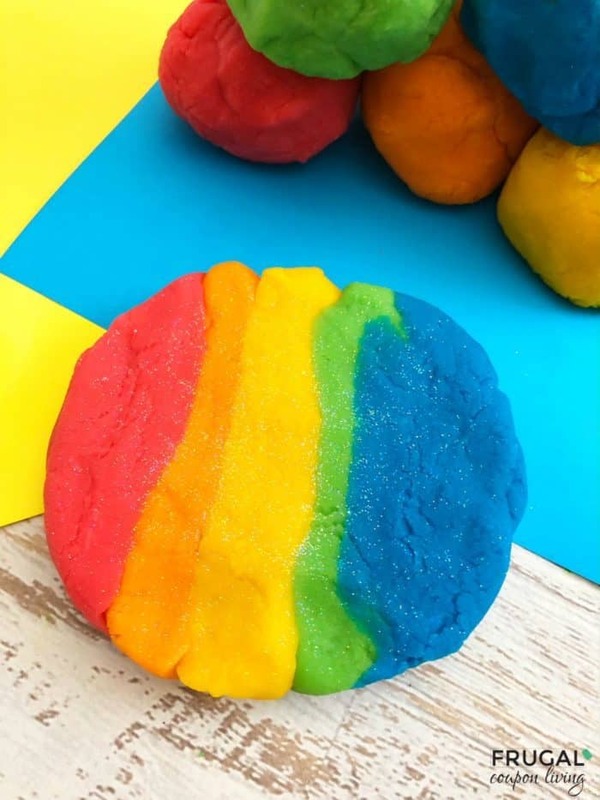 Handmade Rainbow Playdough Recipe with a Touch of Sparkle! Have fun with this homemade rainbow playdough recipe. Easy to make play-doh with a touch of sparkle! Play-doh… is this a favorite in our home. It always has been. I think of my, I mean my kids, favorite things to do with play dough is mold, construct and destroy. I love how, I mean my kids low how it can be molded in too 100 different things in the span of 5 minutes. If you have some fun tools on hand, too, it is fun to carve and shape playdoh into different things. While playdough is never truly out of our budget, making it can be fun too and can add to a rainy day bucket list item with your kids. 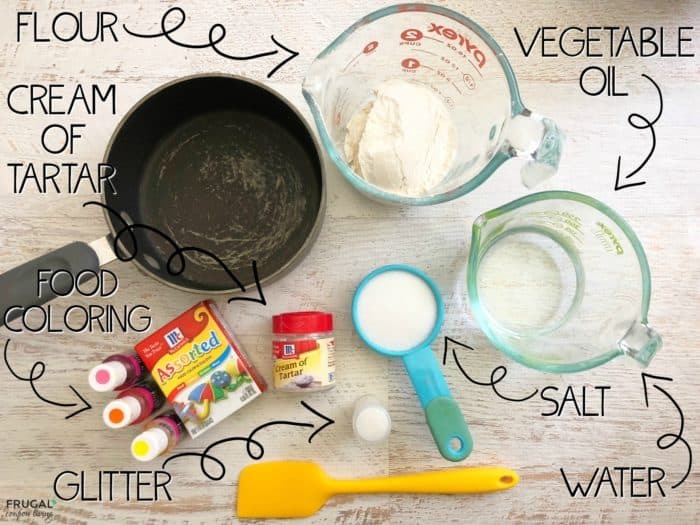 Using a few staples from your home (salt, water, flour, vegetable oil and more) you can have this rainbow playdough in no time at all! Enjoy. In a small pot, combine your flour, water, salt vegetable oil and cream of tartar and a few drops of one color food coloring and mix well. Cook stovetop on medium heat for just a couple minutes, stirring constantly until you have a play dough like consistency. Carefully remove the dough (it will be hot). Once it cools down, roll it into a ball and place in a Ziploc bag. Repeat steps 1-5 with each color. Place each color next to each other and combine into a ball. Roll in glitter and your dough is ready to play with. 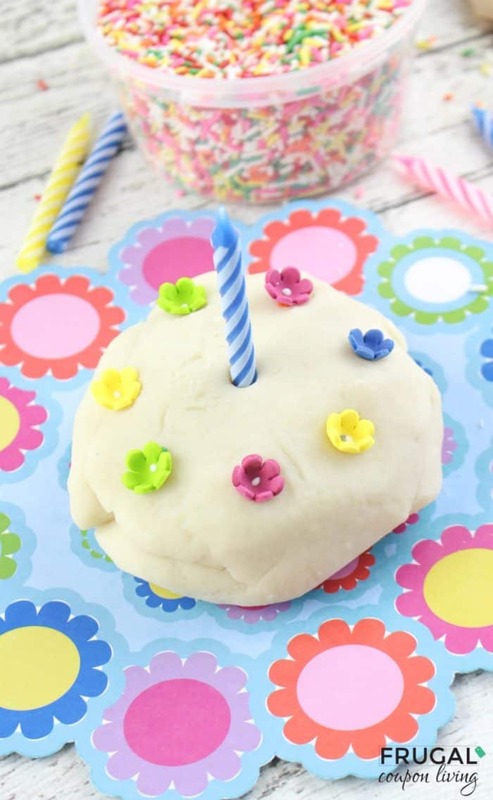 Take a look at this Birthday Cake-Scented Playdough. Pin to Pinterest. 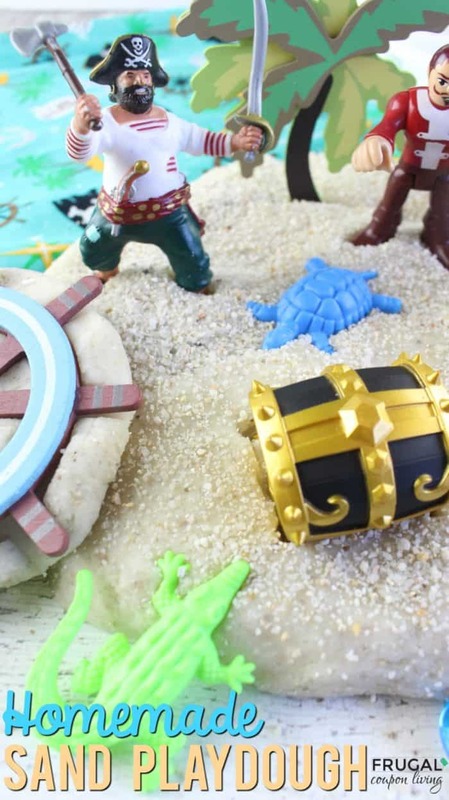 Also fun, take a look at his Pirate Homemade Sand Playdough. Pin to Pinterest.